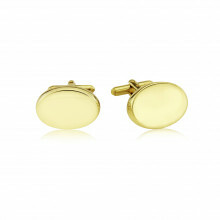 Beautifully crafted Oval Cufflinks, a pared back design making them versatile pieces for the discernible gentleman. The contrast of the iridescent Mother of Pearl against the warm Yellow Gold are truly arresting. Technical features includes "S arm" with a round bar fitting which is attached to the oval stone set cufflink.